In April of last year, digital entertainment service provider RCN partnered with DePaul University to provide a number of exclusive benefits in support of the university’s commitment to teaching, research and public service. As part of this partnership, RCN is offering a special internet deal for DePaul alumni and students. RCN will upgrade DePaul student’s or alumni’s RCN Internet service from 10Mbps to 20Mbps free for six months. To take advantage of this special discount, contact RCN by phone at (866) 618-1813 and mention “Demon Discounts.” The offer is valid on both new and existing service. In addition to the internet special, RCN is providing financial support to several areas of the university, including The Theatre School, the School of Music, and the student body through event sponsorship and on-campus programming. Also, RCN has provided DePaul the opportunity to televise future university events through their “On Demand” platform, accessible to RCN digital cable customers nationwide. RCN Telecom Services of Illinois, LLC is Chicago’s hometown provider of Cable, High Speed Internet and Unlimited Phone service. They have been a part of the community for over a decade, servicing Chicago residents in everything from single-family homes to the condos in Trump Tower with the latest cutting-edge digital entertainment products. RCN cable customers receive over 215 all-digital channels, including 60 HD channels in the basic tier, as well as access to 1000’s of On Demand movies and free On Demand TV. RCN internet is super-fast and reliable, includes free access to ESPN3.com to watch live sports on the computer, and is available in four speeds: 5Mbps, 10Mbps, 20Mbps and 60Mbps. RCN phone service is unlimited and includes features such as voicemail, call waiting, caller ID and more. For more information on RCN services, please visit www.rcn.com. DePaul’s law, part-time MBA and public service programs have all been recognized among the best in the country by U.S. News & World Report in its latest survey of graduate schools. In its review of 190 law schools fully accredited by the American Bar Association, DePaul College of Law was ranked 84th, up 14 places from last year. It is the sixth consecutive year the College of Law has ranked among the top 100 in the U.S. News listing. In a new category for law schools this year, U.S. News asked lawyers to rank nearly 100 law schools. DePaul placed 67th. The College of Law’s health law and intellectual property programs, which are consistently recognized among the best, again were given that distinction by U.S. News. The health law program placed 15th and intellectual property placed 17th in their respective categories. DePaul’s part-time law program was ranked 28th among the 80 accredited law schools that offer a part-time option. U.S. News also identified the College of Law among law schools that have a racially and/or ethnically mixed student body. Schools were ranked in this category based on the total proportion of minority students, not including international students, and a mix of racial and ethnic groups on campus. DePaul’s business school also was distinguished in rankings. U.S. News ranked the part-time MBA program 36th in the nation, up five places from last year. In a different survey of undergraduate business programs conducted by Bloomberg Businessweek, DePaul also was cited among the best. In that survey, DePaul was ranked 56th out of the 139 programs considered. U.S. News also ranked the best schools in the nation for public affairs, and DePaul’s program placed 100th. The survey was based on responses from deans, directors and department chairs representing 269 master’s degree programs. As a Chicago native, Leanne Mai-ly Hilgart (EDU ’04) knows about frigid winters. But as a vegan, she struggled to find a fashionable, warm coat that didn’t rely on animal products like wool. While attending DePaul University, she resorted to wearing one coat for style and two sweaters underneath for warmth. “It certainly ruins your outfit if you have to wear two layers and then your coat!” Hilgart says. In the hopes that no one else would have to compromise their beliefs or their style to make it through winter, Hilgart decided launch her own line of vegan coats. Today her company, Vaute Couture, offers not just coats but shirts, jewelry and more—all without using fur, leather, wool, silk or other animal products. Vaute Couture also emphasizes products that are eco-friendly, fair trade and otherwise ethically produced. Hilgart didn’t have a fashion design background when starting her line. Rather, she had a passion for raising awareness of social issues. She came to DePaul because she loved how the atmosphere encouraged advocacy and service. “It seemed like no matter who you are or what you’re into, there was a group for you and a place for you to become the best version of yourself,” says Hilgart, who founded DePaul Voice for the Animals as an undergraduate and the DePaul Business Corps as an MBA student. Vegan designer Leanne Mai-ly Hilgart (EDU '04) talks backstage with her models during a fashion show. Hilgart hit upon the idea for Vaute Couture while taking classes in brand management and entrepreneurship at the Kellstadt Graduate School of Business. She left grad school in September 2008 because the timing seemed right. “Like everything in entrepreneurship, so much of it is the momentum, so I was ready to take what I had learned at DePaul and start the business then,” she says. After eight months researching vegan fabrics that could stand up to cold weather, she launched for coat preorders in June 2009. What Hilgart started as a small startup in Chicago is now growing to a studio in Manhattan’s Chelsea neighborhood. The company has received positive reviews from sites including Oprah.com and TeenVogue.com, and was named 2010 Company of the Year by VegNews Magazine. Vaute Couture doesn’t have a storefront, so Hilgart uses the Internet, pop-up stores and traveling events to bring shopping opportunities to customers. DePaul University College of Law placed at No. 84, up 14 places from last year, in the latest U.S. News & World Report “Best Law Schools” rankings. This is the sixth consecutive year that DePaul has been ranked among the nation’s top law schools by U.S. News. Two of DePaul’s specialty programs—health law and intellectual property—consistently rank among the best in the country. In this year’s specialty rankings, the health law program placed 15th and the intellectual property program placed 17th in their respective categories. In the area of diversity, DePaul again was identified among those law schools that offered a racially and/or ethnically mixed student body. U.S. News cited diverse schools based on the total proportion of minority students, not including international students, and the mix of racial and ethnic groups on campus. DePaul also placed 28th among the 80 accredited law schools surveyed that offer a part-time option. New to the survey this year is a category in which lawyers ranked nearly 100 law schools. DePaul placed 67th among the schools on this list. Selected rankings will appear in the April edition of U.S. News & World Report magazine and in the 2012 edition of the guidebook, America’s Best Graduate Schools. More information, including law school rankings methodology, is available on the U.S. News website. The No. 12/13 DePaul women’s basketball team and No. 8/7 Notre Dame will meet for the second time in eight days — this time in the semifinals of the BIG EAST Championship. 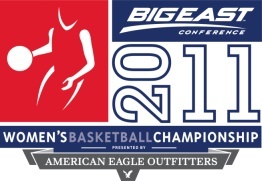 The March 7, 2011, game is scheduled to tip at 8 p.m. at the XL Center in Hartford, Conn. The contest will air live on ESPNU. Drew Olson will provide audio for DePaul’s BlueTube, while in-game updates and notes can be followed at twitter.com/DePaulWBBSID. The Blue Demons are making their second BIG EAST Conference Championship semifinals appearance, while it is their first since 2006. DePaul, who is the second seed in the tournament, reached the semifinals with a 66-54 win over seventh-seeded St. John’s on Sunday. The Blue Demons were led by Anna Martin’s 17 points, while Felicia Chester tallied 10 rebounds. Notre Dame is making its ninth semifinals appearance in the program’s 16th BIG EAST Championship appearances since joining the conference in 1995-96. The Irish reached the semis with a 63-53 win over Louisville. Devereaux Peters paced ND with 19 points, nine rebounds, and six blocks. DePaul and Notre Dame meet for the 35th time on Monday and second time this season. In a series that dates back to the 1978-79 season, the Blue Demons lead the series 19-15 and won the series only meeting at the BIG EAST Championship in 2007. DePaul University earned an honorable mention on The Princeton Review’s second annual list of the best graduate schools in the United States and Canada for video game design. The Princeton Review’s list “Top Schools for Video Game Design Study for 2011” salutes 30 institutions in all (15 undergraduate and 15 graduate) for their outstanding game design education programs. The ranking was established in 2009-2010 in partnership with GamePro, one of the most respected brands in the video game industry, which reaches more than 3 million gamers a month. Ten undergraduate and 10 graduate schools are ranked from1 to 10. Five schools in each group also are recognized as honorable mentions. Reported in the April GamePro magazine (on newsstands March 8), the list also is accessible on the Princeton Review website and on the GamePro website. The Princeton Review, one of the nation’s best-known education services companies, chose the schools based on a survey of administrators at 150 institutions offering video game design coursework and/or degrees in the United States and Canada. Conducted during the 2010-11 academic year, the survey included more than 50 questions. Topics ranged from academics, curricula and faculty credentials to graduates’ employment and career achievements. School selections were based on a comprehensive analysis of data that examined the quality of the curriculum, faculty, facilities and infrastructure, in addition to the school’s scholarships, financial aid and career services. DePaul’s Game Development program also was recently honored when Octodad, a game developed by a team of DePaul gaming students, was named one of eight Student Showcase Winners for the 2011 Independent Games Festival at the Game Developers Conference. It was the second year in a row in which a project by DePaul students was selected for the honor. DePaul University’s graduate school counseling program is the first institution in Illinois and the 24th in the nation to affiliate with The Education Trust’s National Center for Transformative School Counseling (NCTSC) Initiative, bringing national recognition to the program. The distinction recognizes DePaul’s school counseling program as a national leader in the school counseling profession, says Melissa Ockerman, assistant professor in the School of Education. The Washington, D.C.-based organization promotes a new vision of school counseling in which school counselors advocate for educational equity, access to a rigorous college and career-readiness curricula, and academic success for all students. It aims to transform school counselors into powerful agents of change to help close the gaps in opportunity and achievement for low-income students and students of color. In order to qualify for the recognition, Ockerman says school counseling faculty revised curricula and field experiences to align with the five core Transformed School Counseling competencies: leadership, advocacy, using and assessing data, teaming and collaboration, and counseling. Faculty also secured a partnership with Chicago Public Schools and convened an advisory council that comprises current students, alumni, counseling faculty, CPS school counseling leaders, practicing school counselors and supervisors to discuss current program practices, the vision and mission of the program, and revised admission criteria. Affiliation with the national organization is a draw for employers when hiring school counselors as well as for potential school counseling students, Ockerman says. Barbara Karpouzian, director of secondary school counseling at Chicago Public Schools, says she asks for a list of graduates from DePaul’s program so she can recommend them to her high school principals. The School of Education’s graduate counseling program is one of the largest counseling programs in Illinois and one of the most sought-after master’s degree programs at DePaul. School counseling is the largest of the program’s three tracks, which also include community counseling and college student development. For more information about the school counseling program, please contact Ockerman at (773) 325-8646 or mockerma@depaul.edu. You are currently browsing the DePaul Advancement News blog archives for March, 2011.